Here’s another interesting curiosity: Dillard’s, who maintains two stores at Austin’s beleaguered Highland Mall, is suing the Highland Mall Limited Partnership–made up jointly of General Growth Properties and Simon Property Group–for letting the mall deteriorate sharply. Dillard’s plans to close both of their stores in the center, which already lost JCPenney in 2006. Dillard’s alleges that the owner — Highland Mall Limited Partnership, made up of Simon Property Group Inc. [NYSE: SPG] and General Growth Properties Inc. [NYSE: GGP], two of the country’s largest mall operators — let it deteriorate to such a degree that it has forced Dillard’s to close. It would be interesting to see how this pans out; if they’re successful I suspect we may see more retailers take such a tack to exit rapidly deteriorating shopping malls. Does anyone have pictures of the deterioration? I gotta see this? I’m scratching my head on this one. 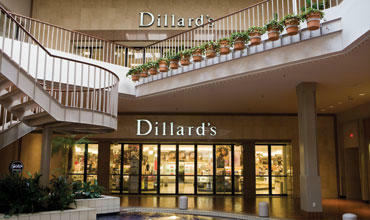 Dillard’s is part of a lot of deteriorating malls, but I’ve never heard of them suing to get out of a lease. Usually, they just close. I think that there is a dollar store in that mall that sells toilet paper. It sounds like Dillard’s has exaggerated the issues at the mall just to get out of the lease. Every mall in the Austin area has tons of gang want a bees running around on the weekends, so that is no excuse. There is a plan to redevelop this whole property, and I am surprised that Dillard’s does not want to wait it out. This story makes me laugh, Dillard’s finally is complaining about the condition of this mall, yet they are located in several malls with just the same or worse conditions. It seems pretty lame to me for them to sue the mall instead of quietly leave. Maybe they are desperate for some $$$, which will be interesting if they pull out of any more Simon & GGP malls. That, would be pretty interesting, considering the large amount of properties owned by those companies with a Dillard’s location. The mall companies better watch out. If this suit is successful retailers may have another way to get out of a lease. Or it maybe a nagociating tactic to lower rent or taxes. Here in White Plains mager landlords & developers keep filing tax assessment challenges to lower the amounts they have to pay. Even if they have received a PILOT within the past few years, they’re allowed to keep filing such challenges. Recent filings cost the city over $600,000 last year. What Dillard’s is doing has already or will have a similar effect on local governments who cant take the finantial hit without large service cuts or property tax increases. I’ve never really been to a mall, knowing it was a Simon property, that really just impressed me. I went to one this weekend, actually, that I thought was a total hole and could see shutting down in a matter of months. I know malls are having a tough time now, with the economy in the shape that it’s in, but when you walk into a mall that appears to have been neglected for 20 years, you just get the vibe that a couple of bad months could shut the place down. In this case I sort of agree with Dillard’s, it’s the property owner’s responsibility to keep the property in decent shape, and make people want to visit that particular mall. Granted, Simon can’t control the neighborhood, they have no conrol over the crime rate, etc., but they can monitor and control who’s allowed on the property. They can also control their tenants, and if it’s not a mix that’s not conducive to Dillard’s business, they should be able to protest. I don’t know what the deal is about this “store that sells toilet paper”, but that does sound a little ridiculous for Dillard’s to complain about. Spencer gifts sells some pretty low-brow gear and they’re apparently not complaining about them. The real problem seems to lie in the people in the mall, and just the general lack of quality stores, and for that I don’t see how Dillard’s is out of line. OTOH, they could just do what the Six Flags Mall location did, and make their store a Dillard’s outlet. That way Dillard’s stays, and offers a location that’s possibly more tuned to the area. @Jeremy: I think in this particular case part of the issue is that Dillard’s has two stores. They own one of the two but have a lease on the other, so they’re suing to get out of that lease. It’s likely that in cases where Dillard’s is in worse malls that they do actually own their store site. This is also part of why old Sears or Macy’s stores will hang on in very old malls, because they own their site and thus it’s fairly cheap for them to operate. One Dillard’s was a former Scarborough’s, the other, a Joske’s. Macy’s was a 1970s Foley’s. I stopped at this mall to kill time on a work trip a few years ago. It was a big, but forgettable mall in an odd location, without a lot of traffic, gangish or otherwise. It’s in a non-chi-chi part of town, but definitely not the worst. Why Dillard’s has picked this one out to play screw the landlord doesn’t make sense. They’ve been neglecting their stores for years and are in a number of worse malls. Given their declining sales, it may be that their “two stores in the mall” strategy isn’t working and they need a way out of it. Actually Highland was not in such an odd location. Even though the area around it has declined in recent years, it is a central location, only minutes from UT and downtown. As far as the “two stores in the mall” strategy, the smaller store, a former Scarbrough’s Dept. Store, carries men’s and children’s items, and the larger one, a former Joske’s, carries women’s and home items. Might not be a bad idea to transform the larger store into a Dillard’s outlet. I don’t think GGP is going to want to get in hot water like this, what with them so close to (possibly, if things don’t turn in their favor) filing for bankruptcy. I’m going to play devil’s advocate here, and put myself into the scenario. Say I owned a mall, and the economy was doing fine. Tenants, per their lease arrangements, are OBLIGATED to fulfill the amount of time they agree to. (be it a year, 5 years, 10 years, whatever). They would not be getting out of it. If the location they have at my mall is not performing up to their goals, they would need to renegotiate terms. If they have a revised set of goals turned in to me, proving they will be able to turn around, along with the rest of the mall doing alright, I’d give them a temporary cut on their rent (for, say, the next fiscal year for that chain) so they may get back on their feet and on the road to profitability again . This is of course, how things are usually done. Now throw in this monkey-wrench of a lackluster economy we’re in right now. I, as the owner of the mall, still have to pay the bills…and these are VERY high, being a set of large buildings that have to be maintained, heated, cooled, secured….all that good stuff. Let’s not forget exterior work…parking lots, the building itself…. With THOSE costs going up, typically if the economy were doing good, you raise the rent-per-month when the lease comes up for renewal. However, the economy is NOT doing good right now. It’s more crucial for me during tough times to keep as many tenants around as I can, since we all know a mall with more shops looks better and brings in more people, but they (the shops) are seeing poor sales due to low foot-traffic (because people aren’t going out and spending cash like they used to), and even with all that going on, I still have to pay those high operating costs to all the various utilities and taxes to the city. A VERY delicate balancing act indeed. If I raise the rents, per usual in a good economic climate, I wind up driving the shops out…they just take the short-term hit to their pocketbook, pay off the rest of their terms in lump-sum, and abandon ship. I’m left with vacancies that (for the time being) will be impossible to fill. If I keep the rents lower for tenants, then “I” can’t pay MY bills. I also don’t make money….worsened with vacancies (which make $0 ), and should worse come to worst, the big bank or city would be after me to foreclose on the mall. Even though the anchor stores in most malls own their own buildings and the slice of land they sit on (including surrounding parking and possibly outlots), I think (I’m not entirely sure on this….correct me if wrong)… they still do pay a rate to the mall owners for being there. They just get a ‘sweetheart deal’ (example: a lower common-area fee) than a normal inline tenant or kiosk would have to pay to reside there. Hopefully mall owners and their tenants will find some middle-ground somehow during these times, but they have to get on the ball fast. Otherwise you’ll see a LOT more of these cases cropping up, and you’ll see in some cases, BOTH parties will lose in the end. The end resuit…. many more vacant buildings that’ll never get reused again and more lost jobs. Ouch! GGP’s situation is because they took on way too much in way too short of a timeframe. Between 1999-2007, they were building out new mixed-used projects, remodeled or expanded quite a few properties extensively, they bought out the Rouse Company (probably the biggest thing that is hurting them right now), plus they had a lot of residential and office properties. They, and other REITs (even those that aren’t as in much trouble, like CBL, Simon and Westfield Corp), need to shed of all the fat and revert to what they know best….shopping center development and ownership. This will be interesting to see where it goes. Lots of malls out there have few inline stores and one or two remaining anchors. The key thing here is, as mentioned above, one of the two locations is one of the 20 in the chain that Dillard’s leases, rather than owns. That’s the big issue, and the reason they are suing, rather than just closing and leaving quietly. Ahh, so the mall (or someone else, but I’m assuming Simon / GGP here) owner owns Dillards’ building. Some JCPenney and Younkers / Boston Store locations here in WI also lease, rather than own, the buildings they occupy, most of the time leasing from the mall owner themselves. If they just owned their own building there, getting out of the lease wouldn’t be as tough as it is in this scenario. Definitely keep tabs on this story. So there isn’t a store that sells nothing but toilet paper? A toilet paper retailer? Holy crap Bat-Man! Sorry, I couldn’t resist that one. Getting back on topic, This whole thing with Dillard’s is such a farce that if you told people this story they would roll there eyes in disbelief. Truth be told I’m one of them, & I think I’m not alone on this. As I said a few posts back this could result in copy cat situations across the country if the suit is successful. WOW @ the video clip! And I tought the Palm Beach Mall has its fair share of probloms.. That is just crazy! I visited this mall on May 03, 2009 and took a bunch of pictures. I posted my experience on my blog at http://southernretail.blogspot.com/. Check it out and leave comments.